When using the menu Verilog-A > Construct Verilog-A Symbol for the above definition, you will notice a dialog box appear asking the location for the device's pins. You would not have seen this with the hello world example as that device does not have any pins. Choose 'left' for 'in' and 'right' for 'out'. We have supplied the above pre-built. See Examples/Manual/gain-block. All the examples used in this manual are available from Examples/Manual. However, you may find it more instructive to enter the code and schematics manually. But we would advise against copying and pasting from this document as some characters may not copy correctly. We suggest type in by hand - note that the quote character before include is a 'back tick' - usually the key at the far left of the row of numbers on US, UK and other keyboards. Run the above in the usual way. You should see an output that follows the input; that is a 1V 1kHz sine wave. In the above definition we have introduced two 'module ports' to the module definition. These define connection terminals and the generated symbol shows these as pins 'in' and 'out'. The V() function in the above is known as an access function. Access functions may have one or two arguments each of which must refer to a port or internal node. If two arguments are provided, V() accesses the potential between the two nodes. If only a single node is supplied, it accesses the potential between that node and ground. The access function I() access the current flowing between its two nodes. 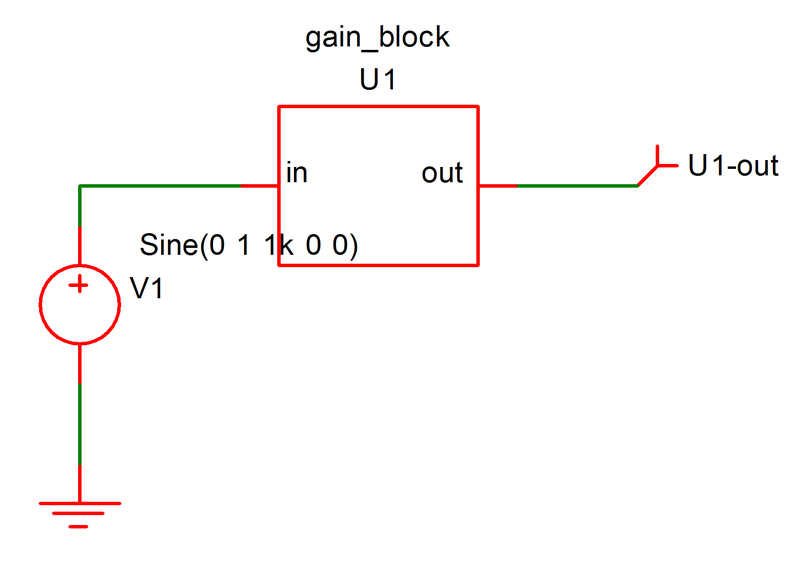 As with the voltage access function, if only a single node is provided, the second node is implicitly ground. The access functions V() and I() are not defined as language keywords but are in fact defined by the electrical discipline contained within the disciplines.vams file. Now rerun the schematic. Notice the output amplitude increase to 5V peak. Nearly all Verilog-A definitions include this line at the top of the file. We excluded it from the hello world example as that did not need it.